"Other animals build homes at the beaver ponds too. Muskrats make homes like beaver lodges, using rushes instead of sticks. Muskrat homes make good platforms on which ducks build their nests. Other birds nest among the rushes bordering the ponds." The year was 1995. Thirteen wolves from Canada were delivered to Yellowstone National Park in an attempt to build new hope for the park's ecosystem. One year later, another ten were added. Twenty-two years later, that introduction has made a tremendous difference, and is proof positive just how successful carefully planned environmental projects can be. From that twenty-three, there are now about one hundred living in the park. It's an important story! 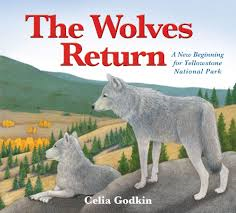 Celia Godkin does a truly admirable job of presenting the project in terms children will understand. The language is clear, the telling is positive and brings awareness for the remarkable results. She shows the natural course of events, beginning with a large herd of elk listening to a sound they have never heard. The wolves call to each other, and head straight toward the elk. It is the first kill for the wolf pack. The elk, of needs, find a safer place to graze. As their valley home responds with new growth, it now provides an invitation to birds and bears to feast on its abundance. Beaver build dams, forming deep ponds that become home to various bird species, insects, fish, frogs ... even otters and birds of prey. It is an amazing transformation. Those changes are portrayed in detailed mixed media artwork. The double page spreads clearly show the park and its dramatic change - all through the introduction of the gray wolf. The settings beautifully display the grandeur of the park, and the interdependence of the species living there. Don't miss having a close look at the endpapers. The illustrations there may result in further research for interested children. Written for a younger audience, it will have impact for older readers as well. While much is learned about biodiversity and the environment, it is presented in a most appealing format. Never did I feel that it was written to teach me something. It is simply a story of life in a very special environment. In final pages we are told a bit about the history of the wolf in North America, and the events that led to its near disappearance in both the United States and Mexico. Once the wolf was placed on the US Endangered Species list people began to ask to have it reintroduced into the country's wilderness. The Yellowstone Park project proves it can be a huge success.